Asihambi – we will not be moved. 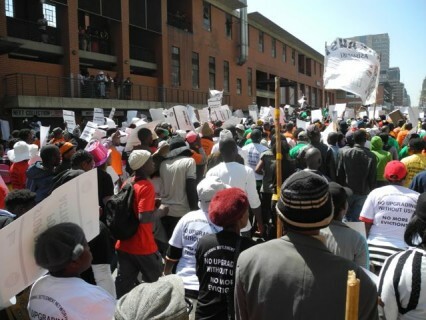 On Tuesday the 11th September, thousands of shack dwellers from Johannesburg, Ekurhuleni (the mining belt), Tswane (Pretoria) and smaller towns and cities such as Mogale City, Midvaal, and Sedibeng gathered on Mary Fitzgerald square in Newtown, Johannesburg. The agenda was a simple but powerful one: mobilising those affected by poor service delivery, insecure tenure, and evictions. 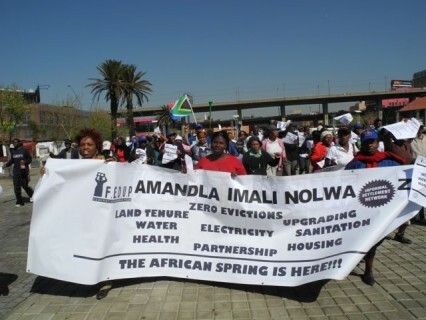 The Informal Settlement Network (ISN) coordinated this march of solidarity, bringing together a constituency of organised communities that have been engaging in vain with local and metropolitan governments in the Gauteng Province. After more than a month’s intensive mobilisation, mass general meetings, and administrative and logistical preparation, residents arrived in their masses on taxis and busses. More than 100 settlements were represented. The march was significantly spurred by the recent draconian evictions of informal dwellers living in the industrial zone of Marlboro South. See previous blog posts (“Spatial narratives”, “The demolition of Chico’s Ice Cream Factory”) and the press release on the emergency situation of evicted families living in interim tents in record cold weather. CORC, in collaboration with the University of Johannesburg’s architecture department, launched a design studio with the community of Marlboro to find technical, social and spatial solutions for the long term upgrading and development of Marlboro. The studio is now regrouping to present locally responsive solutions for the resettlement of Marlboro, although the circumstance have changed fundamentally. 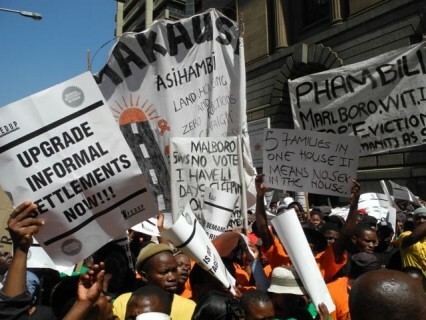 The Marlboro community lodged an immediate interdict against the Johannesburg Metropolitan Police Department (JMPD) and was represented in court by Lawyers for Human Rights. This case, which is a microcosm of the daily lived experience of many informal settlements, informed a more direct agenda for holding government to account. Communities in Gauteng have been engaging local and metropolitan governments for more than three years. Government has not committed to any of the initiatives the ISN launched in e.g. Johannesburg with the upgrading of Ruimsig settlement. A general consensus was reached that more direct measures was imminent, and preparations for the solidarity started. Both the City of Joburg and Gauteng Province alleged in an article by The Sowetan (“Squatter to march against evictions” by Vusi Xaba, 10 September, page 8) that they were not aware of the march. However, ISN have received confirmation letters from the JMPD and the Province confirming the march. See this photo album on SA SDI Alliance Facebook page with all the documents confirming this statement. ISN handed out t-shirts with large slogans reading “no upgrading without us”. The sea of orange, green, yellow, red, black and white rallied around the procession leaders from ISN. At 11am, the march started and continued on Bree Street. The City was brought to a stand still as shack dwellers marched peacefully in solidarity of the campaign against poor service delivery, land and tenure, evictions and disenfranchisement from decision making processes. The tall buildings of Joburg’s Central Business District enhanced the procession music. At noon, the march came to a standstill in Simmons Street where communities rallied around the premier’s office. 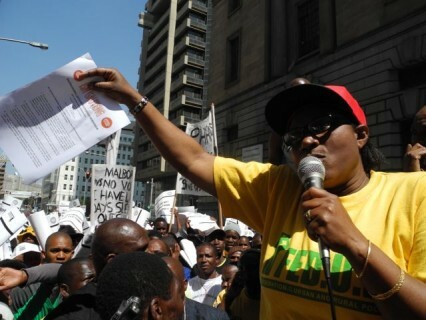 Rose Molokoane, national coordinator of the Federation of the Urban Poor (FEDUP) shushed the crowd as she prepared to read the memorandum to be handed over to the Premier. Provincial Human Settlements department spokesperson Aviva Manqa met Rose on the back of the bakkie. As Rose read the memo (read the memo here), the banners of the residents flew in unison. The doors of development is closed. Left in limbo. 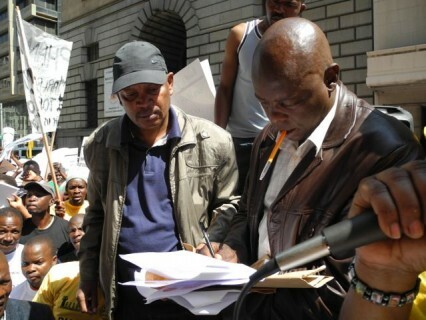 Patrick Magebula, chair of the ISN, and Aviva Manqa signed the memorandum. The ISN called for a response from the Province by the 10th of October, but Mr. Manqa declared that the Province would reply by the end of September. The march was a roaring success and the ISN proved their proved their point: the voices of the poor are to be respected and acted upon. People in informal settlements are organising to promoted people-centred, pro-poor and inclusive city building. Only when the poor are central partners in development can cities be socially sustainable.